I backed the CloudFTP project on Kickstarter with the pledge that secured me a CloudFTP unit which duly arrived shortly after the funding had been successfully completed. CloudFTP is a bit of a misnomer, as it hasn't much to do with cloud computing per se. In fact, this miniature Linux-powered device is designed to make any USB mass storage device accessible via a wireless connection. Plug a USB storage device (an external hard disk, USB stick, card reader, etc. ), boot CloudFTP, and you can access the files and documents stored on any machine or mobile device via a custom HTML5-based web interface or using an FTP client. CloudFTP packs a 2600 mAh Lithium-Ion battery, so the device can run autonomously for about five hours. A power cable that charges the battery via USB is provided, too. The built-in wireless 802.11b/g/n interface ensures speedy data transfer between the connected storage device and your machine. 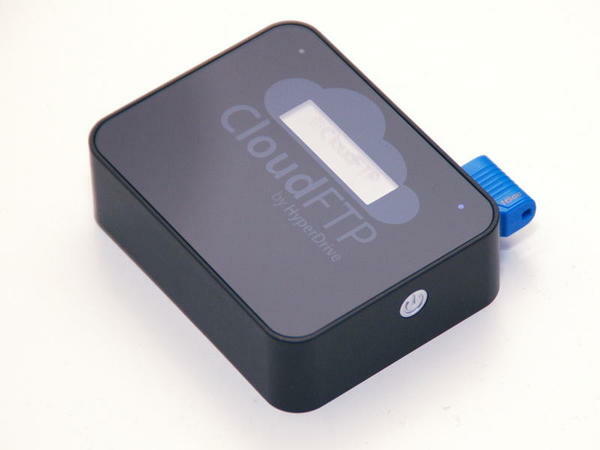 CloudFTP sports a single USB 2.0 port for connecting USB storage devices, and the device can handle all common file systems, including FAT32, NTFS, HFS, HFS+, EXT2, EXT3, and EXT4. CloudFTP can operate in the ad-hoc and infrastructure wireless modes. In the default ad-hoc mode, you connect directly to the wireless network created by CloudFTP. Point then the browser to http://cloudftp to access CloudFTP's HTML5-based interface. In theory, the interface should work on any device and browser that supports HTML5, but in reality, CloudFTP's web front is unusable on Android (I tried it with the Android browser and the latest Chrome beta). On the desktop, Chromium was the only browser that could be used with CloudFTP's web interface. The web front lets you browse the contents of the connected storage device as well as view and stream images and music. The Settings section allows you to modify the available options. Here, you can enable the infrastructure mode by connecting CloudFTP to an existing wireless network. When in the infrastructure mode, the CloudFTP's built-in LCD displays the name of the SSID of the network and the device's IP address, which makes it easier to find it on the network. While CloudFTP's web interface is not perfect, you can access the device via the FTP protocol using a regular FTP client using the cloudftp user name and empty password. You can use this as a workaround until the web interface is fixed. All in all, CloudFTP is a nifty little Linux-based device that can come in handy in certain situations. It won't replace a dedicated file server, but you can use it to share and access files and documents while on the move. As an Android user, you might want to wait till CloudFTP's web interface works properly with Android-based devices, though.